Rev. John I. Jenkins, C.S.C., president of the University of Notre Dame, will preside at a prayer service to honor the legacy of Martin Luther King Jr. from 11:45 a.m. to 12:15 p.m. Monday (Jan. 20) in the Rotunda of the Main Building. The public is invited to participate in the prayer service and the reception that will immediately follow. Other community events will take place to honor King’s legacy both on and off campus. The Office of Multicultural Student Programs and Services’ MLK Study of Race Series will present “The Politics of Play in Latino America,” a lecture by Albert Laguna, assistant professor of American studies and ethnicity, race and migration at Yale University, at 7 p.m. Jan. 23 (Thursday) in Nieuwland Science Hall, Room 123. Laguna will discuss the lack of study of comedy in race and ethnicity scholarship. 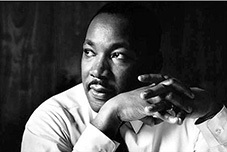 The MLK Series continues at 7 p.m. Feb. 3 (Monday) in the Montgomery Auditorium in the LaFortune Student Center with a screening of “Vincent Who?” The film, about a murder that ignited the Asian-American civil rights movement, will be followed by a discussion with the director, Curtis Chin. For more information on these free, public events, call 574-631-6841 or email msps@nd.edu. Also in honor of the holiday, the DeBartolo Performing Arts Center will present the Kenny Barron Trio at 7:30 p.m. Saturday (Jan. 18). For more information, visit performingarts.nd.edu. Notre Dame’s Office of Community Relations and Department of Africana Studies, in partnership with community institutions, have events scheduled to honor King as part of their yearlong initiative, “The Africana World.” Events include “I Am From: Telling Stories of the Past and Present,” a workshop on how to capture family stories and history conducted by Stuart Greene at 9 a.m. Feb. 22 (Saturday) in the Center for History auditorium, 808 W. Washington St., South Bend, as well as a photo exhibit called “How We Got Here,” featuring images and stories of community members who migrated to the area. The exhibit will be open through April at the Center for History. Other upcoming events include a lecture by Wil Haygood, author of the book “The Butler,” and a panel discussion of the book “The Warmth of Other Suns,” moderated by Richard Pierce. For a complete list of events, visit artsandculture.nd.edu/community-relations/the-africana-world. Additionally, the University is a co-sponsor of “Rekindle the Dream,” a daylong celebration on Jan. 20 presented by the South Bend Heritage Foundation and the Martin Luther King Jr. Foundation of St. Joseph County. Events include a Community Service Recognition Breakfast, a memorial march and a celebration concert. For more information, visit www.sbheritage.org/martin-luther-king-jr-celebration. Originally published by Brittany Collins at news.nd.edu on January 17, 2014.